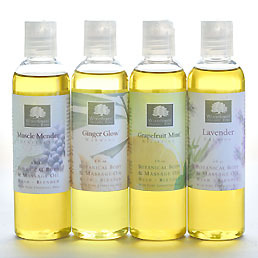 Home > Organic Spa & Body > Organic Body & Massage Oils - 4 oz. Our organic massage oils are the perfect blend of light-as-air, exotic seed and fruit oils known for their moisturizing and skin-nourishing properties, combined with our signature spirit-lifting essential oils for every mood. May be used in massage, as an all-over body oil or add a few drops to the tub for a moisturizing, aromatherapy-infused bath retreat. For Massage: Warm a tablespoon of Botanical Body & Massage Oil between palms, then apply to the body in long, circular patterns, gently kneading the muscles of the back, neck, arms and legs. Reapply as needed. For Moisturizing Body Oil: Immediately following bath or shower, apply a small amount of oil to body and rub in until absorbed to retain moisture and soften the skin. As Bath Oil: Just drizzle a few drops into the water just before you get in the bath. Be careful--May make surfaces slippery! Ingredients: *Organic Sunflower, *Organic Sesame, *Organic Apricot Kernel and *Organic Grape Seed Oils; Select Pure Essential Oils, Vitamin E, Rosemary Extract. (*Certified Organic) 100% Natural. At least 98% Organic. Nut-Free. Vegan. I purchased the Ginger Glow Organic Body oil for my dry legs. I have tried so many different products, only to still have dry legs at the end of the day. Since using this product my legs are so smooth and soft, without all the chemical used in store bought brands. I'm a believer WoodSprite. Thank you!